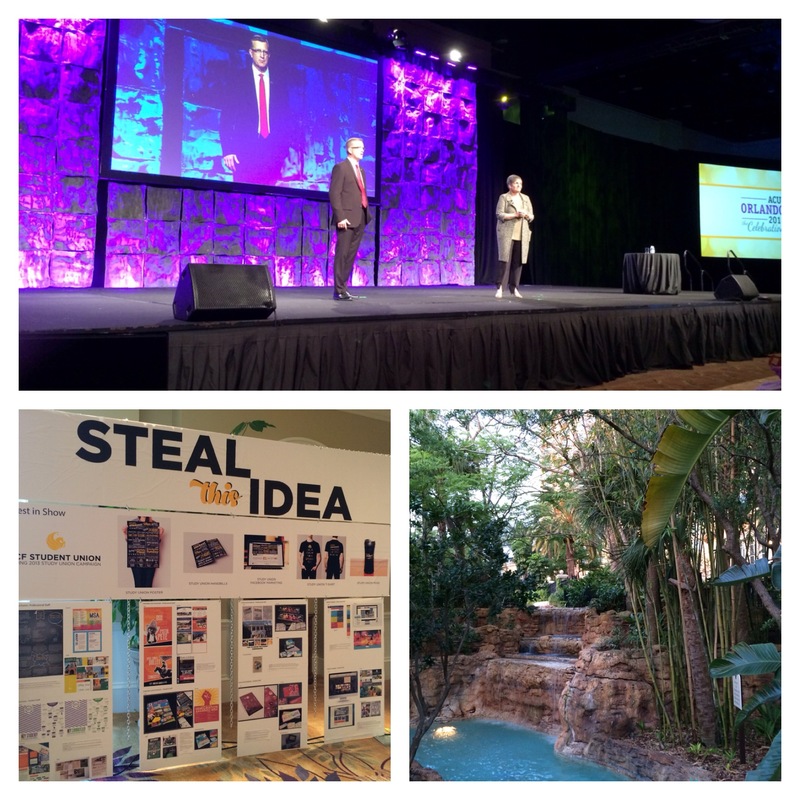 I was very excited to attend the Association of College Unions International (ACUI) 2014 Annual Conference in Orlando, Fl. as part of my professional development plan this year. This year marks the 100th anniversary celebration and what better way to celebrate than with great friends, excellent ed. sessions, fantastic keynote speakers, and the sunshine that (I am sure) is on its way to the midwest soon? I know we’re getting a little lengthy with this post, but there were so many great things I wanted to share with you during this five day conference! Buckle up and here we go! I am a firm believer that the keynotes and ed sessions of a conference make or break the experience. This year’s planning team really had their work cut out for them because they were not only planning the conference, but they also worked with the 100th Anniversary Team to create an extraordinary experience for conference attendees. The keynote selections at this conference were some of the very best I’ve seen. The conference kicked off with a keynote by Jeff Salingo who addressed the role of the college union and the value of an undergraduate degree. He shared great thoughts challenging our view of a traditional college experience. Next, the planning committee incorporated one of my favorite sessions from last year, ACUI Talks. If you ever have to plan a conference, I highly recommend incorporating this into your theme. ACUI Talks was our version of TED Talks. There were four keynote speakers who shared their perspective on storytelling for about 18 minutes each. There were speakers ranging from David Coleman, the Dating Doctor, (who shared the most incredible personal stories) to Bill Mosher (who directs the PBS special, Visionaries). Each presenter brought their own unique view on the importance of sharing our story. This session got me thinking about how well we tell our story at the University Center, specifically in the Graphics & Marketing department. Our story is what sets us apart from every other organization, business, and company on the planet. It should be the foundation of our brand and radiate through all of our messaging. I think that at times we get caught up in the “sell, sell, sell” aspect of business and forget that who we are and what we do matters. Are you doing a good enough job telling your story? The conference also facilitated a panel discussion between four university presidents and surprisingly three of them were women. It was inspiring to hear their stories and life experiences. The last keynote presentation was Laura Ling who is a journalist who was held captive in North Korea. Again, her session focused on storytelling, but also on hope. Both topics were themes throughout the conference. As I was sitting in an educational session by a friend of mine, I began to think…how many times do we put out ideas and projects with the hope that they work? At times, we got too caught up in budgets and numbers and analysis and forget that we need to believe in the ideas that we have. I am completely in favor of analysis and research however; there comes a point where we have to stop and say, this is the right thing…I believe this is going to work. The theme of the conference reminded me of an interview I saw a while back that said if you don’t believe in your ideas, how do you expect others to do so? I’d like to share so many more of stories that were told by keynote speakers, but I just would not do them justice. I highly recommend you look them up if you’re in need of a conference keynote speaker. Finally, I’d like to share with you a few of my take-aways from the conference. Do something that you’ve never done. When I went to the conference, I had my entire schedule planned out thanks to Guidebook (an interactive scheduling app that lets you create your own conference schedule based on the one provided by the conference. LOVE IT) However, it occurred to me that I had picked every technology, marketing, and supervisory session out there. I wasn’t doing anything new, I wasn’t pushing myself to learn new things. So, after much researching and planning before the conference, I changed most of my schedule and attended sessions I would have never thought to attend before. Push yourself to be a well rounded professional. One of the members of the presidents panel said that you need to have a diverse portfolio. Again, push yourself to meet new people and try new things to broaden your horizons. Part of the reason that I get so excited to attend ACUI is because I didn’t go to school for Student Affairs. Conferences are a great way to supplement your professional development. Find a mentor! This doesn’t have to be someone that you have immediate contact with on a daily basis, but select your list of people that you can call no matter what for advice and an impromptu therapy session. Under promise-over deliver, don’t hold a grudge, forgive quickly, and don’t settle. All of these were extremely wise words from a university president that we often forget when life gets busy. What do you take into consideration when designing your professional development plan? What are your must attend conferences? This entry was posted on April 4, 2014 at 5:39 pm and is filed under Uncategorized. You can follow any responses to this entry through the RSS 2.0 feed. You can leave a response, or trackback from your own site.